A SOFT BLENDABLE FOUNDATION DUO FOR THE PERFECT MATCH. Light, medium and dark toned Duo-combinations for cool, neutral and warm skin undertones. With over 70 foundation combinations and endless blends our refillable duo compacts allow for the creation of the perfect to match for your skin tone! Choose your Duo according to the tone and the undertone of your skin and blend to perfection. A perfect choice when you are not sure which colour to choose and if you skin tone varies according to seasons. Refill when empty and re-use in new combinations. Nine different prefilled Duo-combinations available. 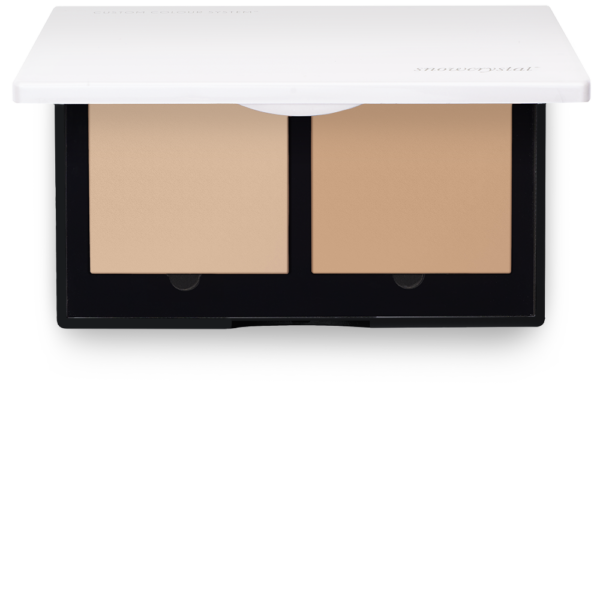 -Light to medium coverage with a perfect velvety face finish. -Excellent blending, moisturizing and skin regeneration properties. -Smoothens lines and gives the skin a natural glow without drying. – Chose a lighter shade for your winter tone and a darker for your tanned summer skin. In between seasons – mix the colours together for a perfect blend. – Chose the lightest shade to highlight and the darkest for contour. – Not sure of your shade? Then chose the two that are closest and blend to get the ideal match. – Refill when empty and re-use. – For application we recommend a sponge.